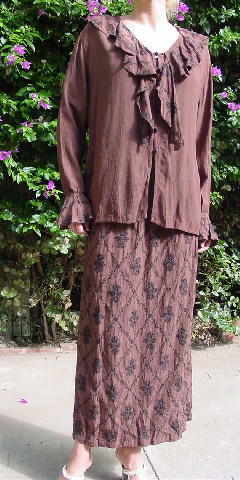 This brown two-piece outfit has a blouse with long sleeves with full 3 3/4" cuffs with a floral black embroidered design. It has a wide neckline with a 4 1/4" wide collar which flows into two 13" long ties, all with the embroidered black floral design. There are 6 black elevated round cord buttons down the front. The bottom 8" in the front flows freely and is 3" shorter than the back. 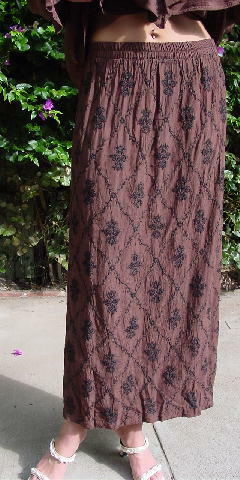 The skirt has a 1 1/2" wide elastic waistband. 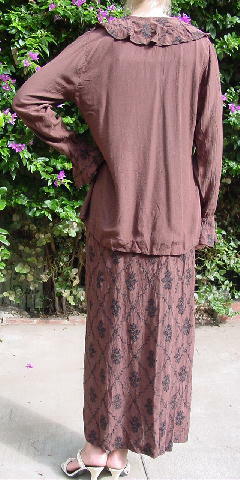 The long skirt has the black embroidery all over it. 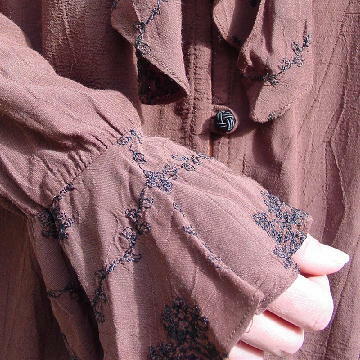 It's nice soft fabric with very nice detailing. It's from a stylist's inventory, and was worn in a photo shoot. shoulder to end of sleeve 26 1/2"
shoulder to bottom side hem 26 3/4"
bottom hem side to side 22 1/2"